The OT3 (4). Life ruiners I tell ya. Long after the series is a distant memory (already is really) I will wuv them FOREVA! Succeed or there will be spankings! That is an order!. 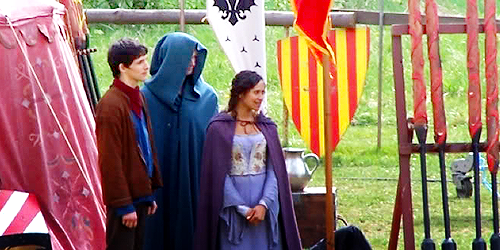 Wallpaper and background images in the Arthur and Gwen club tagged: bradley james angel coulby colin morgan. This Arthur and Gwen photo might contain tabard and surcoat. Love love love the colours and everything about this composition. The only thing that would make this better would be if we could see Bradley's face a little better. His face would make every pic better. Oops, I think I stole Joppa's line. Sorry!